I'm a big fan of Mangalorian dishes and have tried many recipes when we were in US. But never clicked any pics apart from this chicken ghee roast ,yes, these pics were shot in Aug 2011, see how old it is. 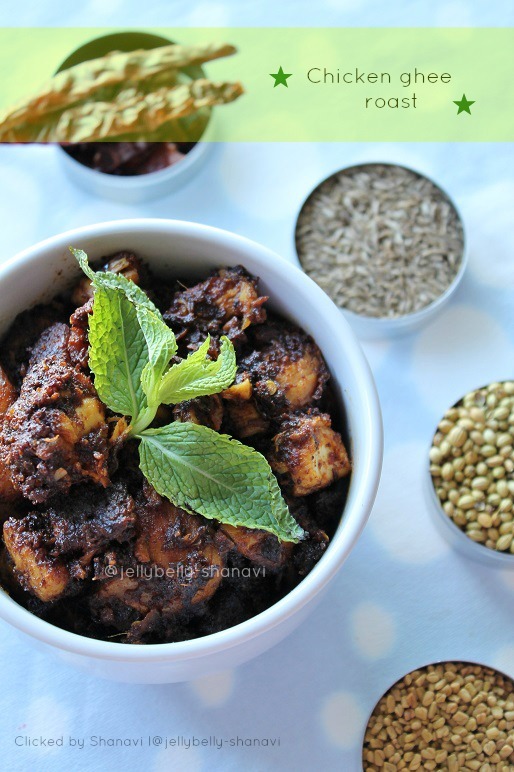 Beware, this dish uses lot of ghee , nevertheless, the taste was amazing with full of freshly prepared masala. Njoy..
Small red chillies -- 8 nos. Garlic cloves -- 16 nos. Cut the chicken into medium sizes/ bite sized pieces. Marinate the chicken with yogurt, lime juice, turmeric powder and salt. Refrigerate for 4 hours or more, may be over-nite. Heat a pan and roast the ingredients from 1 to 7 one by one without burning it. 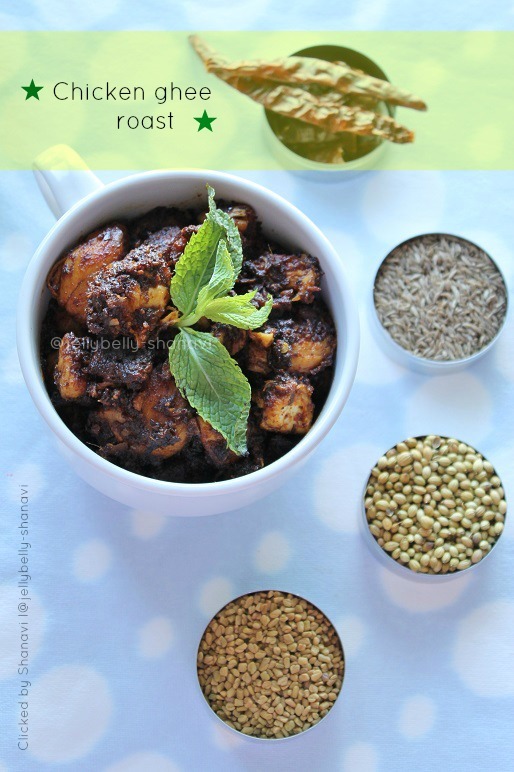 Grind the roasted masala along with the turmeric paste and make a fine paste. Clean the mixie using 1/4 cup of water and save the water for later use. Heat a big pan with 1/4 cup of ghee and fry the marinated chicken until it gets almost cooked, but not fully cooked. Now u may see little gravy along with the chicken. Just drain the chicken and place on a separate plate. Retain the gravy by collecting it in a separate bowl. To the same pan add the remaining ghee and fry the ground masala paste for 5 to 8 minutes over medium flame, or until the masala starts leaving ghee on the sides. Make sure not to burn the masala mixture while doing this process. Now add the fried chicken, curry leaves, already retained gravy and the water saved while cleaning the blender/mixie, the water content including the gravy should not exceed more than 1/2 cup + 2tbsp. Also add salt, REMEMBER the marinated chicken already has salt in it. so add accordingly. Fry the chicken till the masala dries up and becomes sukka like texture, that might take around 8 minutes on medium flame. 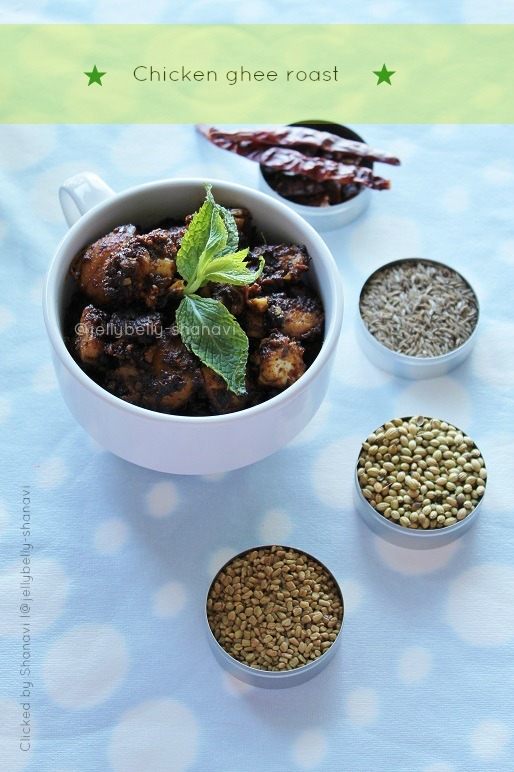 Sprinkle the powdered jaggery and stir together with the masala. Finally garnish the dish with chopped coriander leaves and serve immediately. Kashmiri chillies are not spicy at all. So u may go ease on the quantity mentioned here. Also the other chillies , small red chilly is hot, so add according to ur taste bud. Adding jaggery or sugar suppress the hotness of the dish to some extent. Ghee gives extra ordinary flavor to this dish but if u think it's too much reduce the ghee by half and add oil instead. Dont kill me like this, mouthwatering and incredible chicken ghee roast, your pics itself makes me hungry. New recipe to me,looks fantastic!! Yumm....very tasty and lip smacking dish.fabulous clicks..
An exotic combination of spices I must say, ghee must have given it a nice aromatic nutty taste. Mouthwatering chicken roast, luvd it. Wow what a beautiful colour and I the flavour seems to be awesome. Fab recipe dear. Perfect for sambar and rasam rice.Killing with ur chicken.